Experience the pure glide of JO H2O COOLING water-based lubricant, now in a thinner formula designed to supplement the body’s natural feminine moisture. This water-based lubricant delivers silky smooth comfort and rinses off instantly with just water for super easy cleanup. Try it alone, with a partner or with your favorite toy. JO For Women H2O Water Based Lubricant delivers the sensual comfort of our popular JO H2O lube in a signature formula created just for women. Containing zero silicone, this silky smooth water-based lube is also free of harsh chemicals and animal byproducts. 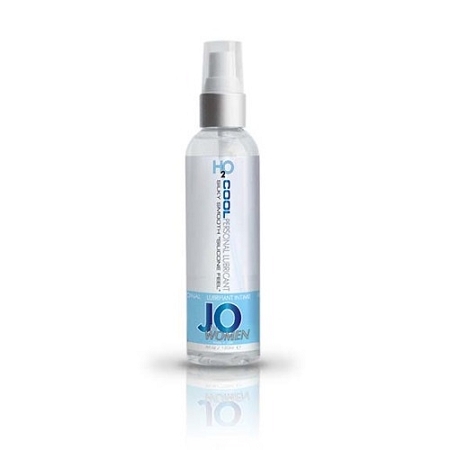 JO For Women H2O for Women uses only plant-based glycerin that won't disrupt pH or lead to feminine irritation. JO For Women H2O is made with the highest quality pharmaceutical grade ingredients for a longer lasting glide that mimics the body's natural feminine moisture. never sticky or tacky, this water-based lube is recommended by doctors and women's health care experts worldwide. 100% latex compatible and safe for use with all toys. Contains NO SILICONE, WAX OR OIL.